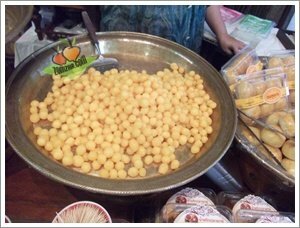 Thong Yod (The Egg Drop Coated in Syrup) is an ancient Thai dessert served in suspicious ceremonies. It made from the mixture of egg yolk and flour boiled in syrup. It is in popular family of desserts consisting of Thong (meaning Gold) in all of the names : Thong-yib, Thong-yod, Foy-Thong, all mean to wish everyone with gold; much money and treasure, and to spend forever. Squeeze egg shells with sugar until well mixed. Pour jasmine water and pandan leaves into the mixture. Heat this mixture until boiling and syrup get condensed. Heat all ingredients until boiling. Let it cool. Beat the egg until fluffy. Gradually add flour. Pour a bowl. Heat the syrup until boiling. Split the flour with egg mixture into a brass pan. Thong Yod should look round with tiny tail, and translucent. Then spoon onto clear syrup. The drop shape is formed by dropping the thick mixture from the tip of a finger into hot bubbling heavy syrup. The drops are then removed into still, cooled lighter syrup after cooking. Both outer and inner of Thong Yod should be soft. If you give Thong Yod or related desserts above (Thong-yib, Thong-yod, Foy-thong) to someone at a wedding, it means that you are wishing for them to have fabulous wealth in the future.